Chinese model Liu Wen may be involved in a fashion-oriented advertising campaign for the Apple Watch, according to an image that she recently shared on Instagram. 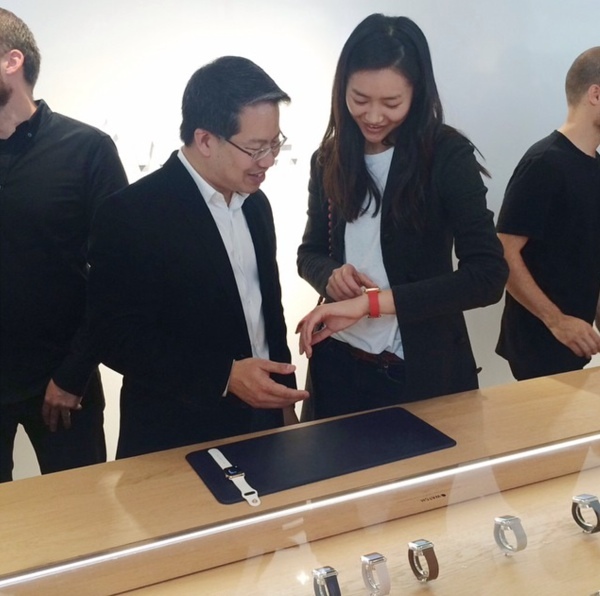 In a photo that shows her trying on the Apple Watch at Parisian fashion boutique Colette, Wen writes "My second meeting with the #AppleWatch, this time in Colette. The first time? Well, you'll see soon." Several fashion publications have taken Wen's statement to mean that she is somehow involved in marketing the Apple Watch, possibly taking part in an upcoming advertising campaign designed to promote Apple's wearable device. Liu Wen is a well-known fashion model, who has modeled for high-end luxury brands like Dolce & Gabbana, Hermes, Gucci, Chanel, and more. The Apple Watch is Apple's first product that has had a distinct focus on fashion, and the company has been working towards positioning it as a high-fashion accessory. In addition to debuting the Apple Watch at French luxury boutique Colette last week, Apple also made an effort to include high-profile fashion editors and bloggers at the September event where the Apple Watch was introduced along the iPhone 6 and 6 Plus. As Apple gears up to launch the Apple Watch in early 2015, it is likely that the company will hold additional fashion-oriented events in order to promote the device. Apple may take several different approaches in its Apple Watch advertising to reach a wide range of potential customers, as June rumors suggested it was also testing the watch with multiple professional athletes, who may also be involved in advertisements. Ahead of introducing the Apple Watch, Apple made a number of hires from various luxury retailers, including Angela Ahrendts, the former Burberry CEO who now serves as Apple's head of retail, and Paul Deneve, the former Yves Saint Laurent CEO who now works on "special projects." Apple has also picked up Patrick Pruniaux, a former Tag Heuer Sales Director, and famous designer Marc Newson. The company's Apple Watch, expected in early 2015, will be available in a wide range of materials and at several different price points. On the lower end, the Sport version of the device will retail for $349, and rumors have suggested the higher-end solid gold Edition models could sell for thousands of dollars. That's because it's not for sale yet. A high end watch mage in china using slave labor! Now what will the Swiss and other high-end watch makers think? Apple is doing this correctly. Smartwatches are currently marketed to tech lovers haven't really sold as much. Apple is doing the same as watch makers: market it as a fashion accessory to complement your attire/mood. Is it only recently apple has start paying for product placement? According to Nielsen, a global marketing and advertising research company, Apple devices have made 891 appearances in TV shows in 2011, which is an increase from 613 appearances in 2009. Also, Brandchannel, which tracks product appearances, reported that Apple products popped up in over 40 percent of movies that struck gold in the weekly box office in 2011. This is huge compared to most brands. While most companies have to pay to have their products featured in a TV show or film, Apple has managed to do so for free by simply offering as many free iPhones, iPads, and Macs as needed. "Apple won't pay to have their products featured, but they are more than willing to hand out an endless amount of computers, iPads and iPhones," said Gavin Polone, producer of HBO's Curb Your Enthusiasm. "It's kind of a graft situation." Apple's product placement goes back to the 1990's when the PowerMac laptop made an appearance in Mission: Impossible. Now, the latest Mission:Impossible movie is featuring about eight minutes of Apple products like iPhones, iPads and Macs. The approximate value of this screen time is $23 million. But it's the only way to sell this thing. No one who's into tech is excited about it, because it's not an exciting tech product. That is your personal opinion. I'm personally excited for it. Granted I'm also poor so I'll have to wait a while but I do want one eventually. 1. The user interface is a confusing mess and it has to be controlled by constantly switching between 5 different input methods! Touchscreen, press touchscreen, a button, a little scroll wheel, clicking on the scroll wheel... this is insane! 1. How is it a confusing mess? Would you have rather had only a touch-based interface in which you fingers obstruct what's on the screen? BTW, apart from the digital crown, the :apple:Watch has less physical buttons than the iPhone, which has a fingerprint reader on top of a button, a power button, two volume buttons, and a switch. 2. It is nothing on its own. Has to have a constant connection to an iPhone that does everything the watch does but better AND faster. 2. The :apple:Watch was never meant to replace the smartphone/tablet that you constantly carry around and stare at all day. The watch is meant to be complementary and out of the way. 3. Battery life is terrible. 3. You make it sound like if there's other smart watches with better battery life. 4. Ugh, really? How often were you planning to bathe with a watch on. 5. Way to fat. You can't even get it under a shirt sleeve. 5. Clearly you're just spewing what you've heard from others, since I'm sure you physically haven't tested that out. 6. The marketing campaign targeted at wannabe fashion victims at Paris Fashion Week is a real turn off too. 6. Fashion Week in Paris is about art and culture, which seems to me what Apple is trying to converge with technology. What's wrong with that. You go to Paris Fashion Week and to fashion models and you try to make this ugly thing into a must have fashion accessory for desperate Vogue readers who buy fake Armani hand bags. Right... No one. It has a custom SOC that nobody has, the best build, a new OS, two new input methods, a method of charging nobody else has, the best screen, etc. And that's only the things we know about. Man, nothing tech or new about this thing AT ALL. I haven't worn a watch in over 20 years and could care less about making a fashion statement. So what will this watch do that an IPhone 6 won't ? Just can't see the value of this for the masses. With all due respect, why should the masses care about if you have or haven't worn a watch for any span? Also, why should they care what your priorities are for the watch? And who really anointed you as a tastemaker in the first place? 1. These watches are not ugly. If you think they are, you need an eye examination. 2. Vogue readers don't buy _fake_ Armani hand bags. They are not exactly expensive. 3. You are "into tech"? If you are "into tech" instead of "into technology" then _you_ are the desperate one. 4. If you are "into tech", Samsung has a watch for you. Apple will outsell them ten to one. Are you trying to be funny or insulting? I'd say you failed at both. (About Apple outselling Samsung's watch at least ten to one). I know. You haven't been posting anything here unless you could think of something that sounds negative about Apple, so nobody really thinks you would care about Apple's fashion watch outselling Samsung's stalker watch ten-to-one. But I must say, it is amazing how vocal you are trying to critisize the Apple watch when you don't care.